So declared Kai Newkirk, Democracy Spring’s campaign director, who spoke to Breitbart News on Saturday while the movement marched outside the city limits of Philadelphia. “We are going to disrupt business as usual until our demands are reached,” stated Newkirk. The coalition of far-left groups plotting mass civil disobedience, with thousands pledging to risk arrest, launched its operation on Saturday at Liberty Bell in Philadelphia’s Independence Mall. From there, the revolutionaries have set out on a 10-day trek with eight stops in total, culminating in a sit-in in Washington, D.C. on April 11 that is slated to last at least five days and is supposed to be the movement’s main event. 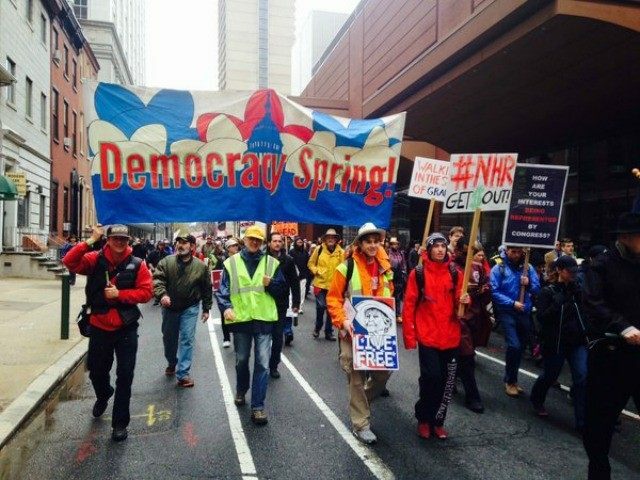 From Philadelphia, Democracy Spring marchers are planning protest stops in Wilmington and Newark in Delaware; Perryville, Joppa, Baltimore, Elkridge, and Beltsville in Maryland; and then encamping in Columbus Circle at 11 AM Eastern on April 11. Newkirk said that 100 people are currently participating in the full march, with activists hailing from 33 states across the country. Each city stop is expected to draw its own pool of local protesters. Newkirk said that at least 100 more people are marching with Democracy Spring today in Philadelphia. Newkirk said his organization has secured the help of local churches and residents who are “opening up their homes and establishments, providing food and housing, and some committing to come.” He said that the march itself will not include civil disobedience tactics. The main civil disobedience event is slated to be the sit-in that starts on April 11 in D.C. As of this writing, Democracy Spring has 3,161 confirmed protesters who pledged specifically to risk arrest at that function. Updates to the group’s website stress April 11 as the intended main escalation. Last month, this reporter penned a widely-read article documenting that with little fanfare and almost no news media attention, some of the same radical groups involved in shutting down Donald Trump’s Chicago rally earlier this month were plotting a mass civil disobedience movement under the banner of Democracy Spring. Democracy Spring is threatening “drama in Washington” with the “largest civil disobedience action of the century,” replete with the arrest of thousands of their own activists. “We will demand that Congress listen to the People and take immediate action to save our democracy. And we won’t leave until they do — or until they send thousands of us to jail,” the Democracy Spring website declares, channelling rhetoric from the Occupy movement. The pro-Bernie Sanders MoveOn.org has been playing a prominent role in organizing anti-Trump activism, including in the recent shutdown of the billionaire’s rally at the University of Illinois at Chicago Pavilion. Another group endorsing Democracy Spring is the Democratic Socialists of America (DSA). The DSA’s Chicago branch drove protesters to the nixed Chicago Trump event, as this reporter exposed.